A U.N. expert says the world is witnessing "a new and very worrisome practice" of governments abducting people in foreign countries using undercover operations, citing the case of missing Saudi journalist Jamal Khashoggi. Bernard Duhaime, chair of the U.N. Working Group on Enforced Disappearances, told the U.N. General Assembly on Thursday that "these abductions occur with or without the acquiescence of the host state." While in most cases "the victims reappear in detention after a short period," he said, "in other cases they remain disappeared — as in the recent shocking case of Saudi journalist Jamal Khashoggi." Duhaime reiterated a call for an independent international investigation into Khashoggi's disappearance and the identification and prosecution of the perpetrators. He expressed outrage at the actions of countries that resort to enforced disappearances. "Whether it is used to repress political dissent, combat organized crime, or allegedly fight terrorism, when resorting to enforced disappearance, states are actually perpetrating a crime and an offense to human dignity," Duhaime said. Treasury Secretary Steven Mnuchin says he will not attend an investment conference in Saudi Arabia. Mnuchin made the announcement on his Twitter account earlier in the day, saying that the decision was made after a White House meeting with President Donald Trump and Secretary of State Mike Pompeo. Mnuchin says in his tweet, "I will not be participating in the Future Investment Initiative summit in Saudi Araba." Fox Business Network is pulling out of a business conference in Saudi Arabia following an international outcry over the disappearance of Saudi journalist Jamal Khashoggi. "Fox Business Network has canceled its sponsorship and participation in the Future Investment Initiative conference in Saudi Arabia," the network said in a written statement. "We continue to seek an interview with Crown Prince Mohammad bin Salman." Several top executives have withdrawn from the conference dubbed "Davos in the Desert." Among them are JPMorgan Chase CEO Jamie Dimon, Blackrock CEO Larry Fink and MasterCard CEO Ajay Banga. Leading human rights and journalists' organizations are urging U.N. Secretary-General Antonio Guterres to launch a U.N. investigation into the disappearance and "possible extrajudicial execution" of Saudi journalist Jamal Khashoggi. The Committee to Protect Journalists, Amnesty International, Human Rights Watch and Reporters Without Borders said at a news conference at the United Nations headquarters on Thursday that Turkey should press the U.N. to initiate a transparent investigation. They say the investigation should probe Saudi Arabia's role in Khashoggi's disappearance and aim to identify everyone responsible for ordering, planning and executing any operations related to Khashoggi's disappearance on Oct. 2. Robert Mahoney, deputy executive director of the Committee to Protect Journalists, said: "U.N. involvement is the best guarantee against a Saudi whitewash or attempts by other governments to sweep the issue under the carpet to preserve lucrative business ties with Riyadh." President Vladimir Putin says Russia will wait for the outcome of a probe into the disappearance of dissident writer Jamal Khashoggi before deciding what impact it may have on relations with Saudi Arabia. Speaking on Thursday at an international policy forum, Putin said "those who believe that there was a murder must present evidence." He noted that "the disappearance was a tragedy, but we need to understand what happened" before deciding what impact it may have on Russia's relations with Saudi Arabia. Putin noted that "the U.S. bears a certain responsibility" for what happened to Khashoggi, a Saudi citizen who went into self-imposed exile in the U.S.
Britain's trade minister has pulled out of a Saudi investment conference over the kingdom's involvement in the disappearance and alleged slaying of dissident journalist Jamal Khashoggi. International Trade Secretary Liam Fox is the latest high-level Western official to drop out of attending next week's summit in Riyadh. French Finance Minister Bruno Le Maire and Dutch Finance Minister Wopke Hoekstra have also canceled, along with several senior business executives. Britain's Department for International Trade says Fox "has decided the time is not right for him to attend the Future Investment Initiative." Britain says it is "very concerned" about the disappearance of Khashoggi, who was last seen entering the Saudi consulate in Istanbul earlier this month. 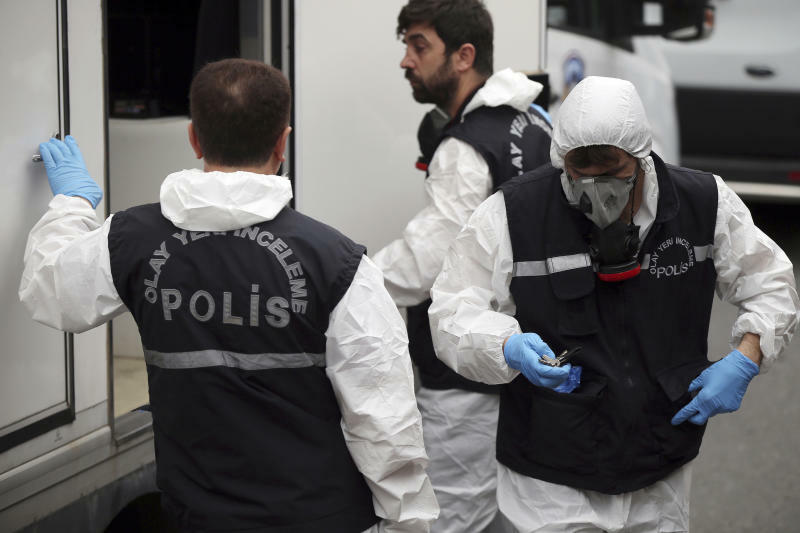 Turkish officials say he was killed and dismembered there. A pro-government Turkish newspaper has published surveillance video images showing a man who previously traveled with Crown Prince Mohammed bin Salman's entourage to the United States walking into the Saudi Consulate in Istanbul before writer Jamal Khashoggi vanished there. The Sabah newspaper's reported on Thursday shows the man also later outside the Saudi consul general's home, checking out of a Turkish hotel and leaving Turkey on Oct. 2. Images shot by the Houston Chronicle later distributed by The Associated Press show the same man was in Prince Mohammed's entourage when he visited a Houston subdivision in April to see rebuilding efforts after Hurricane Harvey. The AP couldn't immediately verify the man's identity. Saudi Arabia has not responded to repeated requests for comment from the AP over recent days, including Thursday.